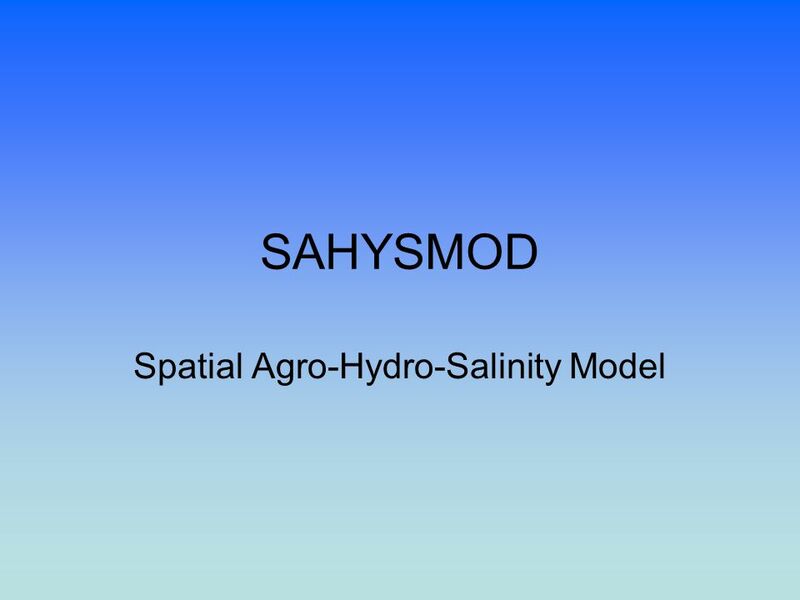 SAHYSMOD Spatial Agro-Hydro-Salinity Model. INTRO. 4 Polygons The principle of Sahysmod is a network of nodal points (nodes) with coordinates. 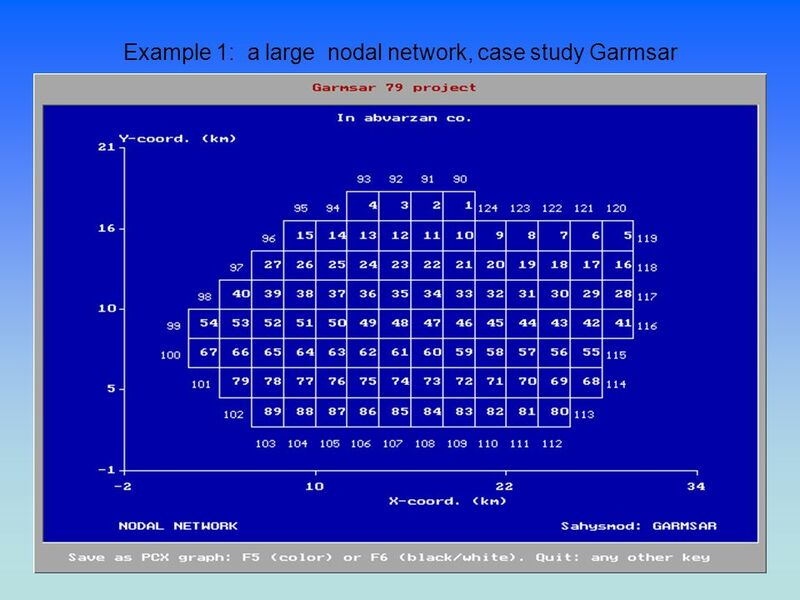 Then, polygons are made around the nodes using the principle of Thiessen. 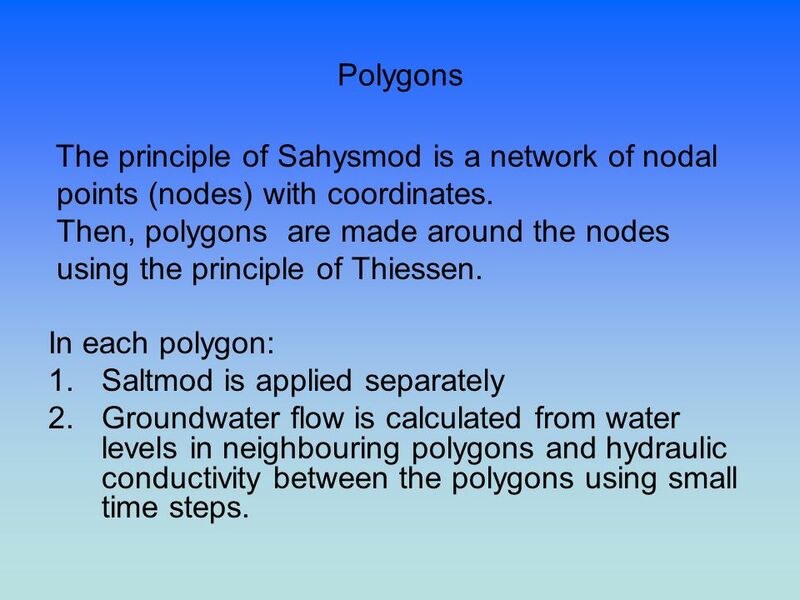 In each polygon: 1.Saltmod is applied separately 2.Groundwater flow is calculated from water levels in neighbouring polygons and hydraulic conductivity between the polygons using small time steps. 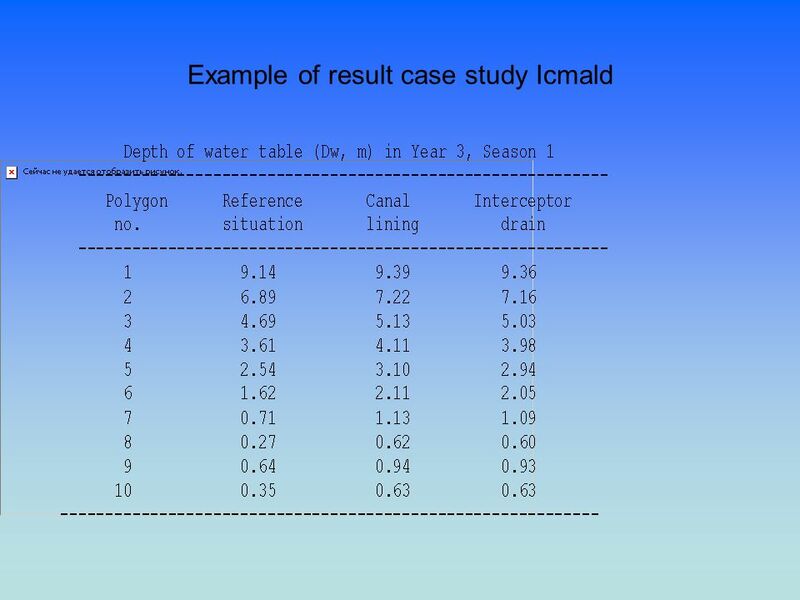 11 Results We can see that canal lining and interception drainage have a small effect in the lower part, because the infiltration losses from the canal are small compared to the deep percolation losses from field irrigation in the upper area. In the lower part there is little irrigation due to water logging and salinity. If we increase the irrigation for reclamation and cropping, the water table will become very shallow again. 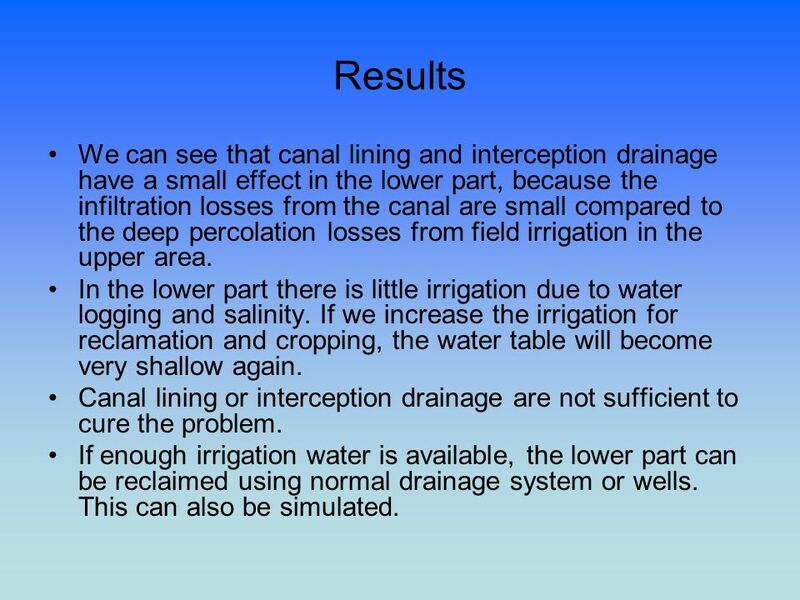 Canal lining or interception drainage are not sufficient to cure the problem. If enough irrigation water is available, the lower part can be reclaimed using normal drainage system or wells. 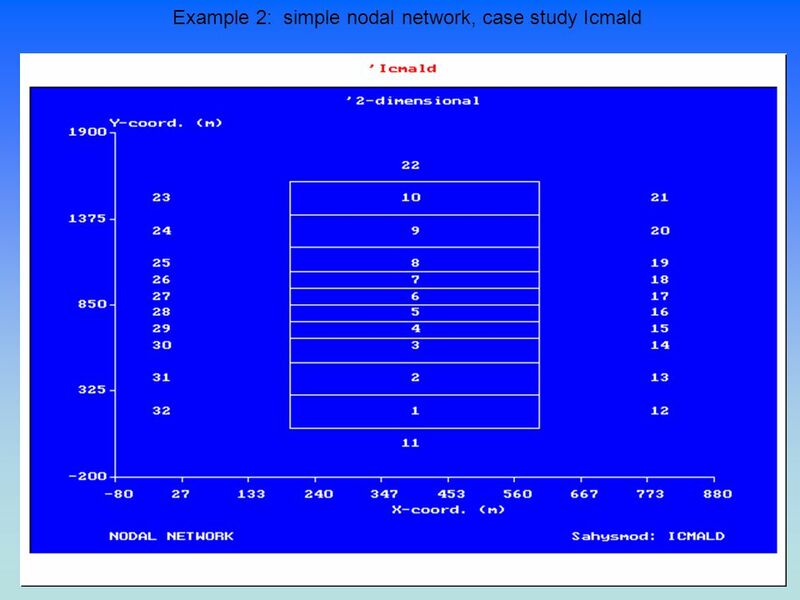 This can also be simulated. 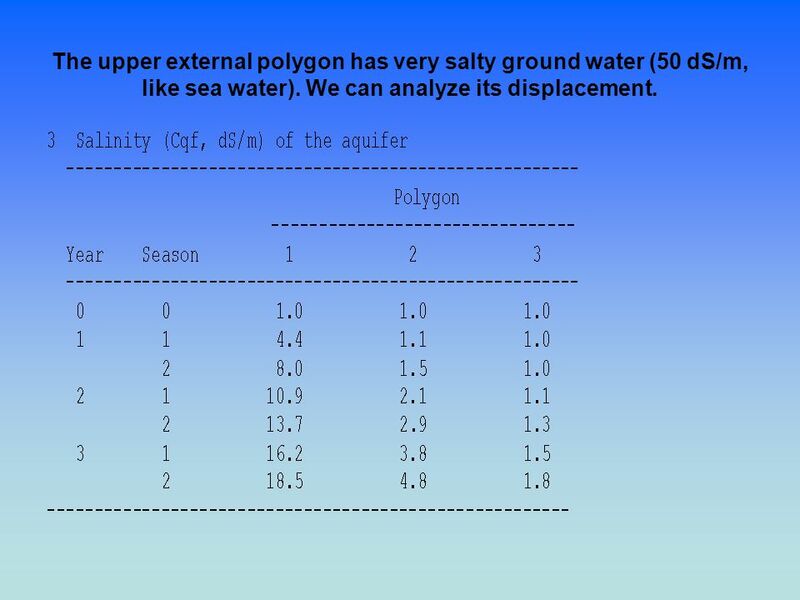 12 The upper external polygon has very salty ground water (50 dS/m, like sea water). 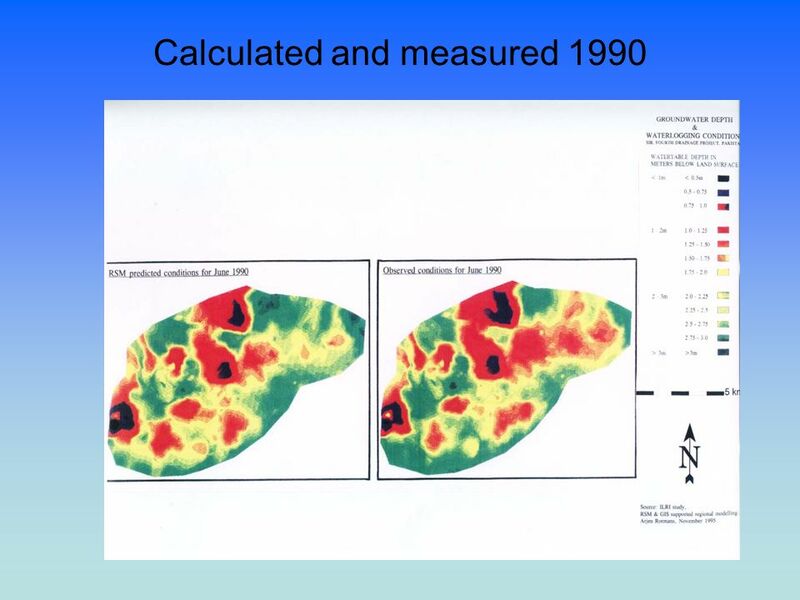 We can analyze its displacement. 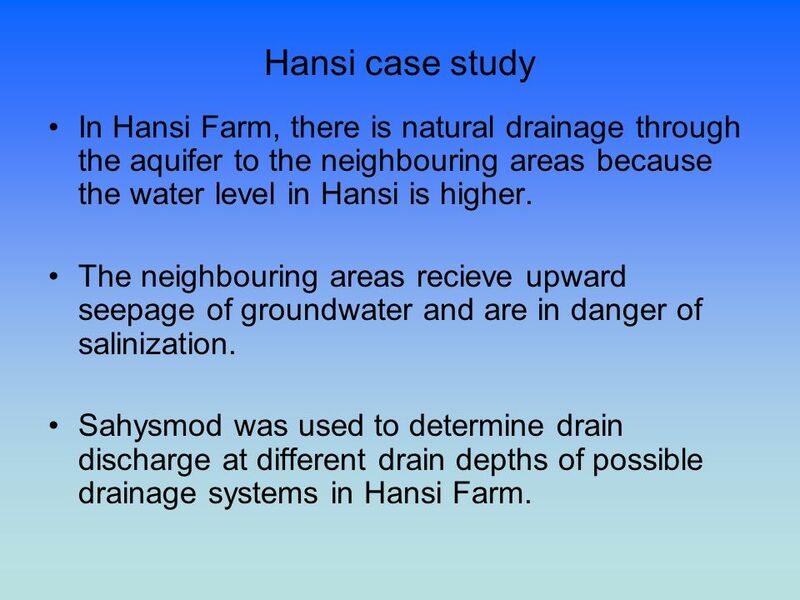 15 Hansi case study In Hansi Farm, there is natural drainage through the aquifer to the neighbouring areas because the water level in Hansi is higher. The neighbouring areas recieve upward seepage of groundwater and are in danger of salinization. 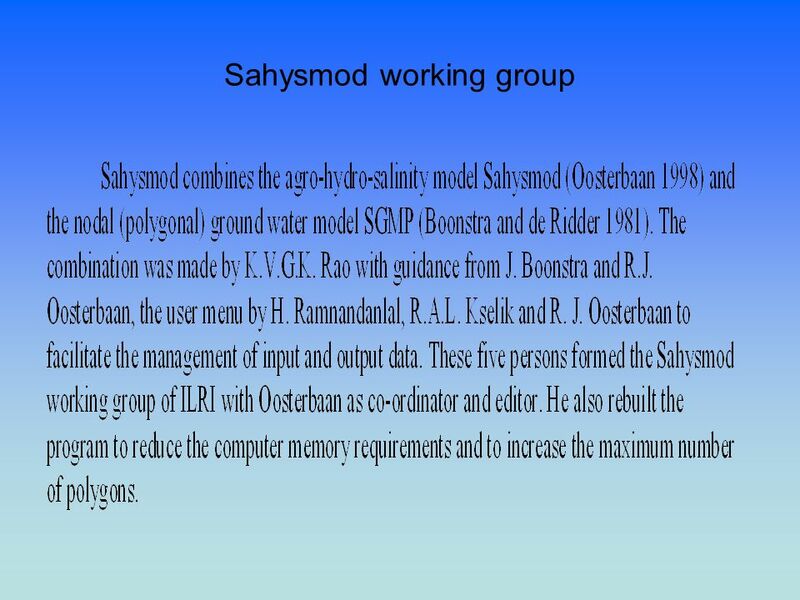 Sahysmod was used to determine drain discharge at different drain depths of possible drainage systems in Hansi Farm. 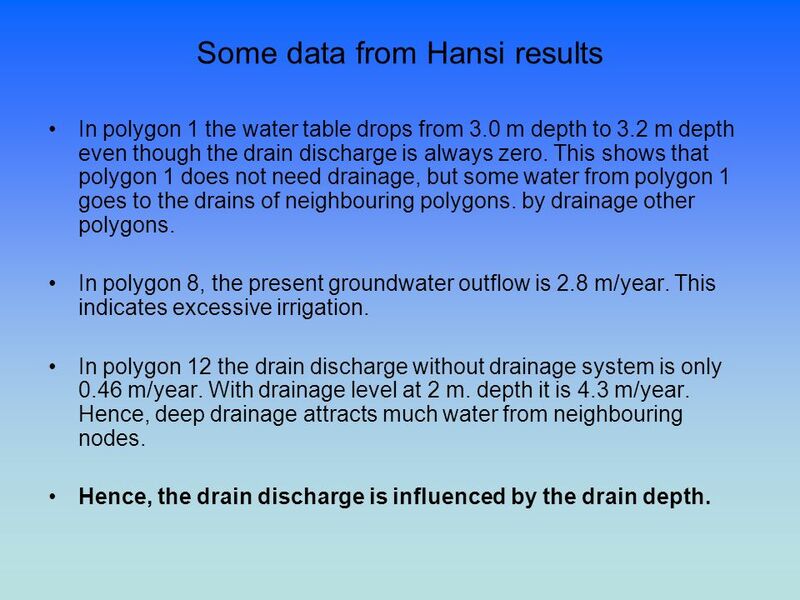 17 Some data from Hansi results In polygon 1 the water table drops from 3.0 m depth to 3.2 m depth even though the drain discharge is always zero. 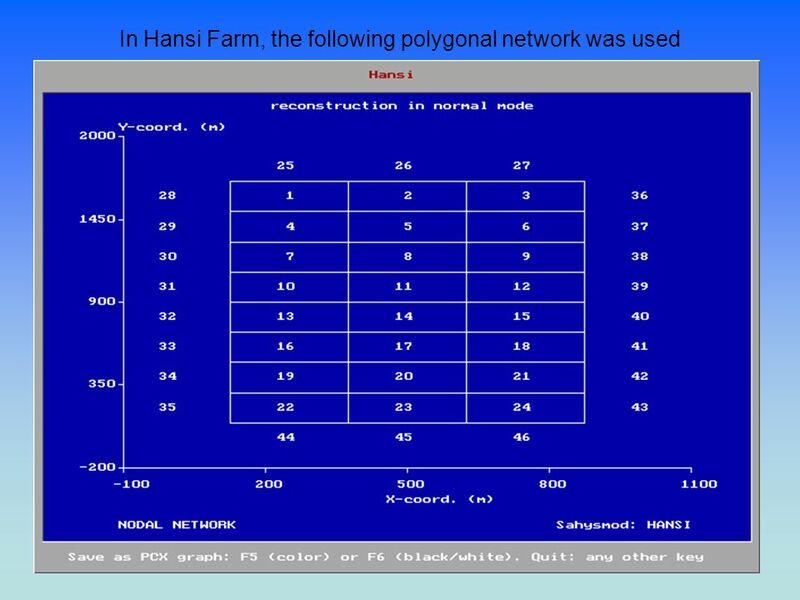 This shows that polygon 1 does not need drainage, but some water from polygon 1 goes to the drains of neighbouring polygons. by drainage other polygons. In polygon 8, the present groundwater outflow is 2.8 m/year. This indicates excessive irrigation. In polygon 12 the drain discharge without drainage system is only 0.46 m/year. With drainage level at 2 m. depth it is 4.3 m/year. 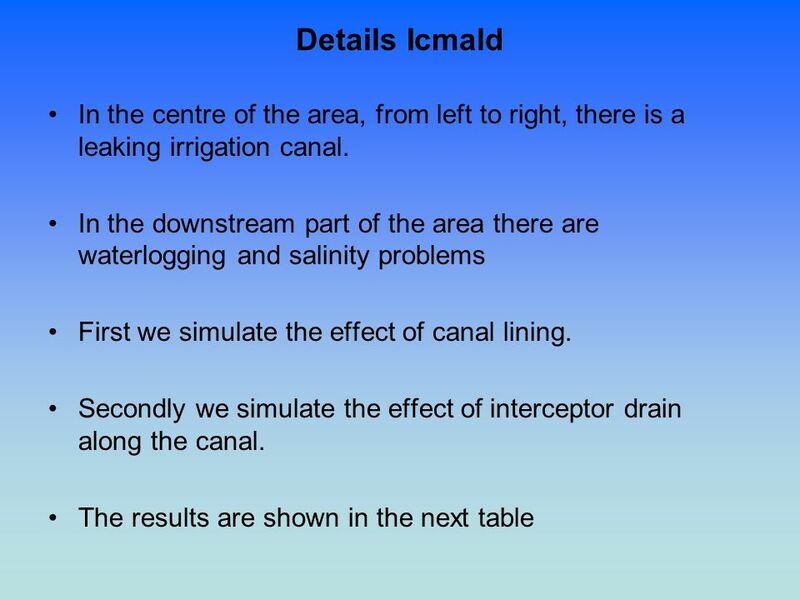 Hence, deep drainage attracts much water from neighbouring nodes. 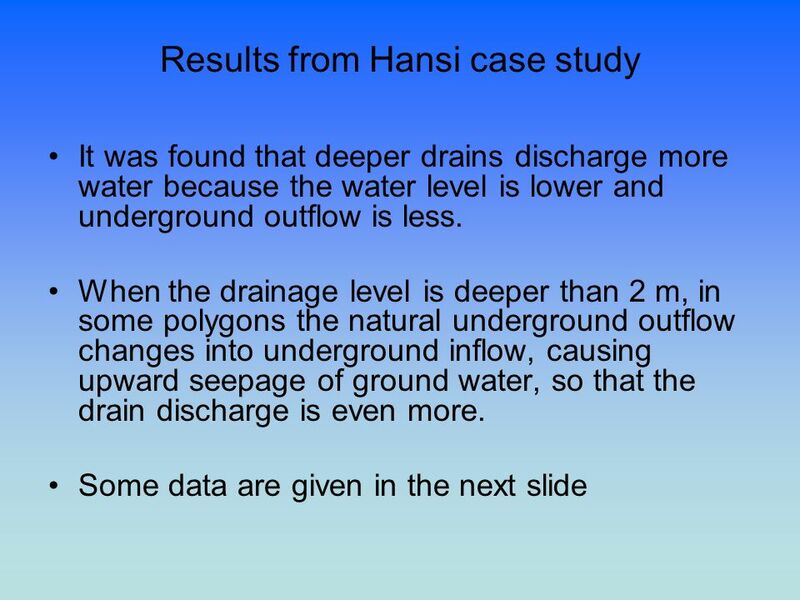 Hence, the drain discharge is influenced by the drain depth. 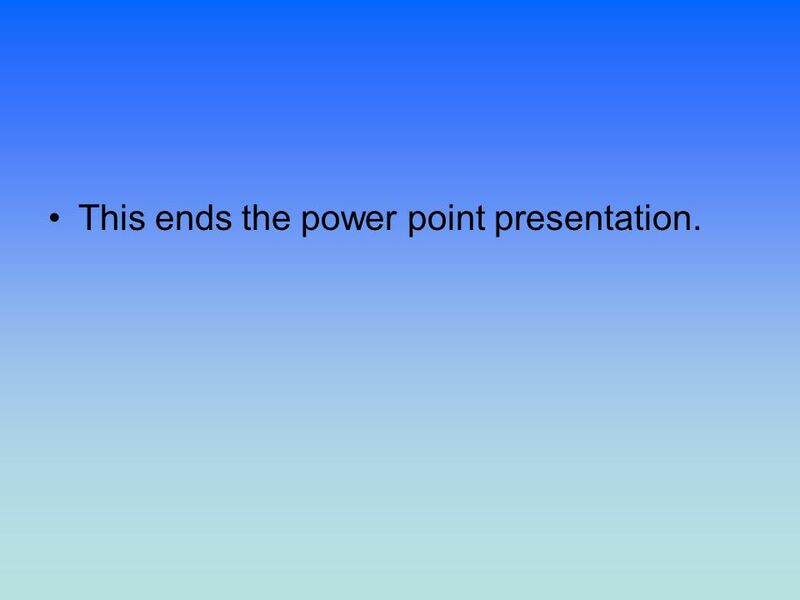 22 This ends the power point presentation. 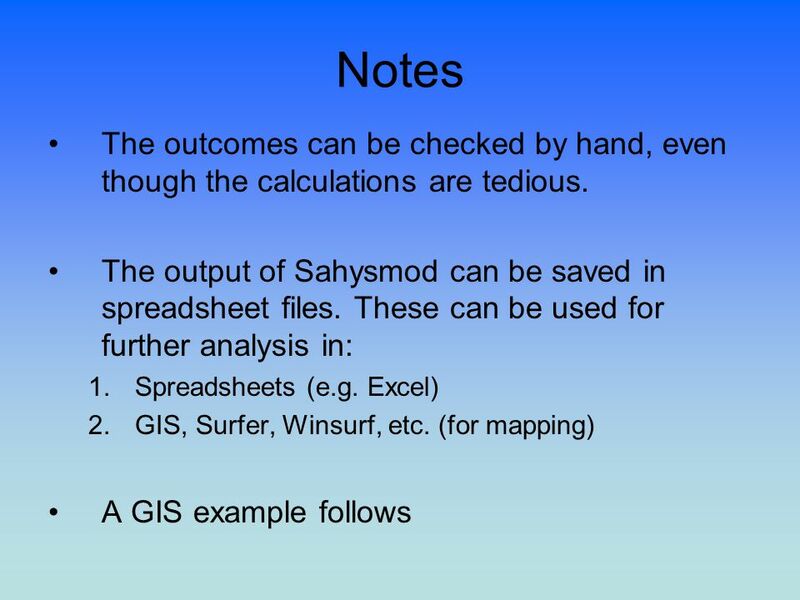 Download ppt "SAHYSMOD Spatial Agro-Hydro-Salinity Model. INTRO." 4. 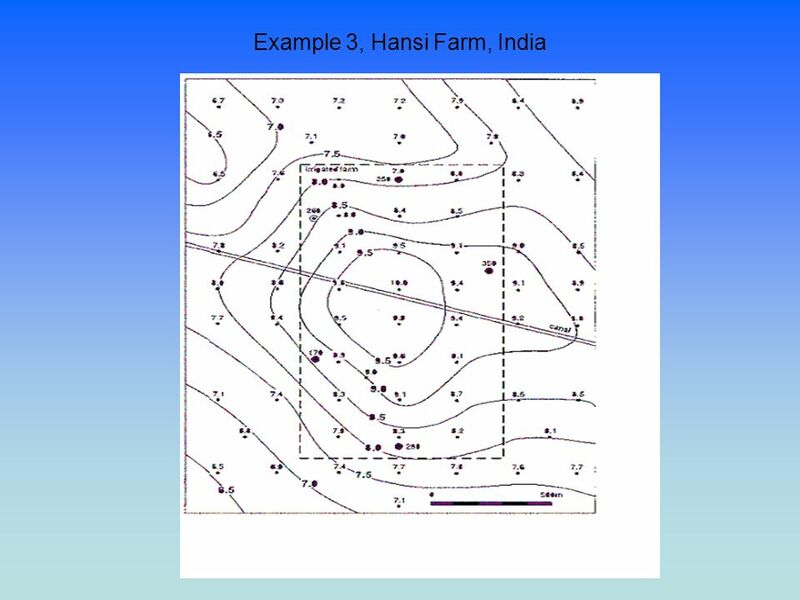 What is the boundary between two drainage basins called? 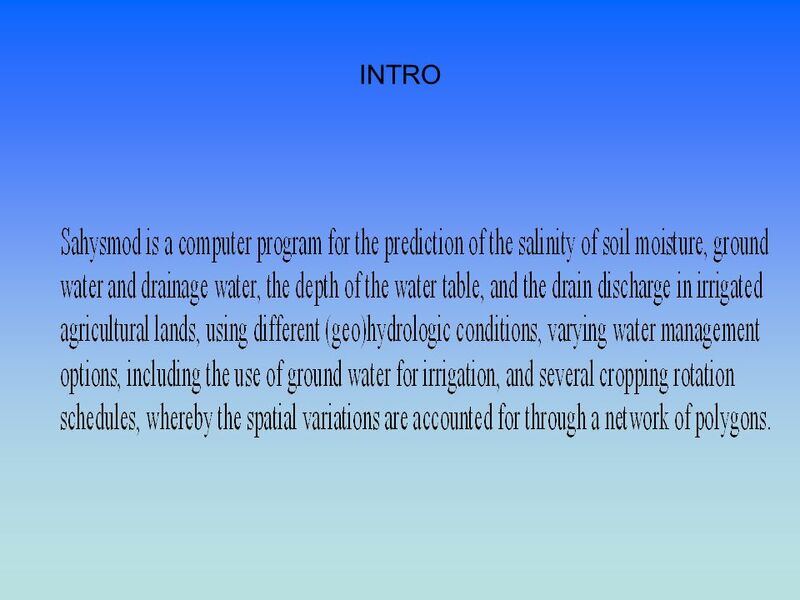 S A L T M O D A computer program for the prediction of the salinity of soil moisture, ground water and drainage water, the depth of the water table, and. Settlement…well drained land that was free from flooding Site…protection from the cold and strong prevailing winds Situation…a place where people live. RiverSalt A spreadsheet program Water and salt balances along rivers in (semi)arid zones that provide water for irrigation and receive drainage return. Observations of Water Table Levels in Assumption Creek and at the South Edge of the Seminary Fen Sam Wetterlin 11/1/13. 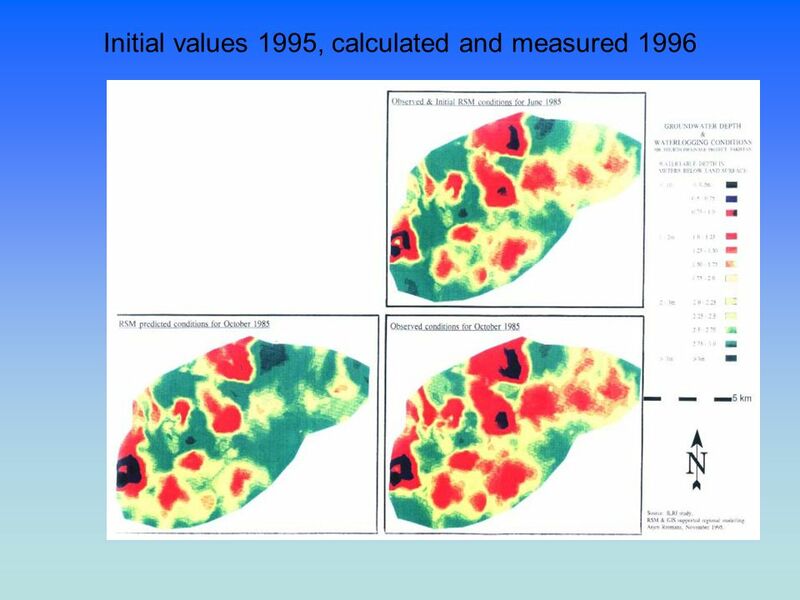 Getahun Wendmkun Adane March 13,2014 Groundwater Modeling and Optimization of Irrigation Water Use Efficiency to sustain Irrigation in Kobo Valley, Ethiopia. 1 Toshihiko Anzai 1* Katsuyuki Shimizu 2, Yoshinobu Kitamura 2, and Jumpei Kubota 3 1:The United Graduate School of Agricultural Sciences, Tottori University. 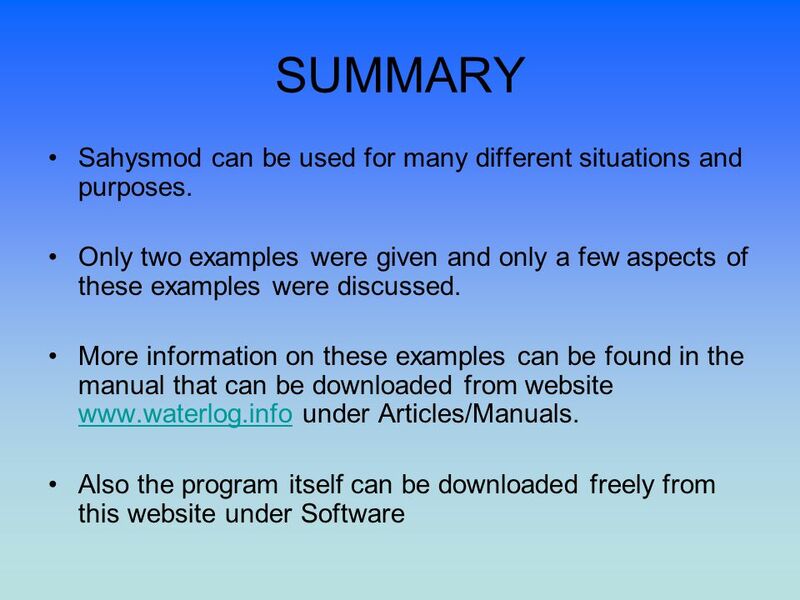 The Hydrosphere Part II- Ocean & Freshwater Resources. 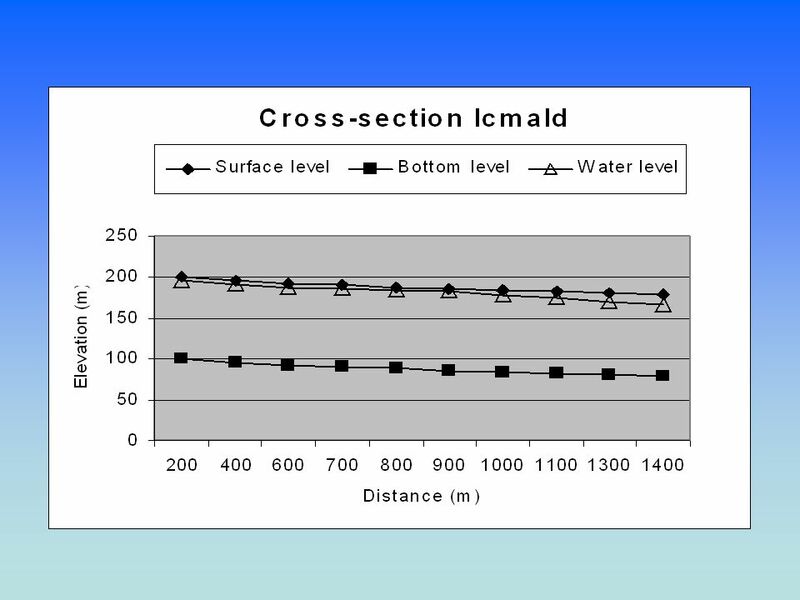 INTERCEPTION DRAINS, WATERWAYS AND WEIRS Interception drains also - cut-off drains, stormwater drainsalso - cut-off drains, stormwater drains "standard"
Hydraulic simulations Model used –HEC-RAS 4.0b –1D model Boundary conditions –Upper: Discharge hydrograph –Lower: Constant sea levels [N …2.50. 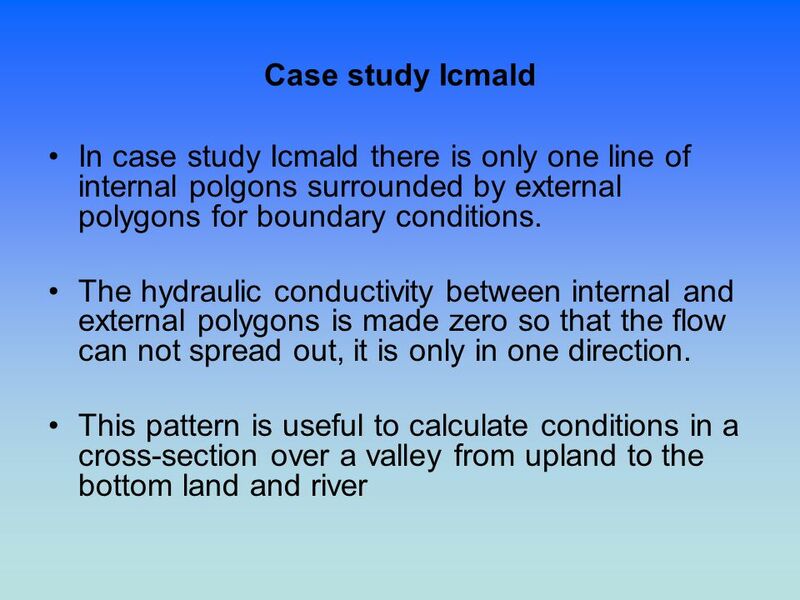 Week 22GEOG2750 – Earth Observation and GIS of the Physical Environment1 Lecture 18 Hydrological modelling Outline: – Basics of hydrology – Creating hydrologically.